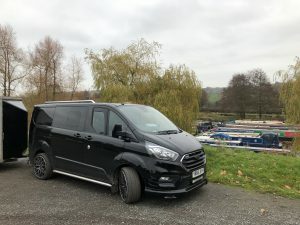 We were called in to remove and dispose of 150 litres of contaminated fuel from a canal boat at Chirk Marina, North Wales. The boat had been stood for several months and diesel bug had set in causing the filters to clog up and prevent the engine from running! After doing some research on the internet the owner read our reviews and gave us a call. 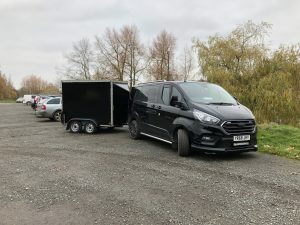 After talking him through our process and reassuring him that we’ve done hundreds and access is no problem as we have a fully portable fuel drain kit he booked us in. 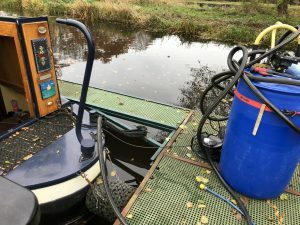 We quickly assessed the hazards and proceeded to manoeuvre our kit into place… using our atex approved fuel pump and specialist hoses to avoid any spillages into the canal we had the tank drained and flushed out within 25 minutes! We put 15 litres of fresh clean diesel in to get the engine running and waited on the bank whilst he manoeuvred thee boat down the marina to fill back up. If you’re having fuel problems either inland or coastal marinas then we have a solution for you… we offer fuel removal & disposal or for larger quantities fuel polishing. Canal boat fuel drain at Chirk marina, North Wales.